When I was going through massage school, I was incredibly impressed to learn that when a therapist got good at their craft, they could literally find buttons in the body (we call trigger points) to deactivate pain. What a fantastic idea! But what exactly is a trigger point and what can we do about them? “Trigger points are present in the majority of cases of chronic muscular pain. They are formed as a result of muscular strain, which in turn can be the result of some kind of trauma, including an accident, exposure to cold or infection, or overuse of a particular set of muscles. Areas of strain also form in misaligned areas of the body, where muscles have to work constantly to maintain distorted positions of the bones. Trigger points always manifest in areas of shortened musculature. It is common to locate trigger points in contracted muscles that are being treated by deep tissue therapy. “The exact mechanism of trigger point activation is unknown, but it is postulated that the constant presence of waste products within a damaged group of muscle fibrils, apparently produced by unrelenting cellular metabolism in that section of the muscle, stimulates nerve endings in the area to send amplified input to the spinal cord. This stimulus is then thrown back into the peripheral nervous system through weakened or facilitated nerve pathways. The impulses traveling along these nerve routes activate pain sensations in a specific portion of the muscles stimulated by those particular nerves. The areas affected by trigger points are called referred pain zones. “Trigger points are self-perpetuating. They accompany a phenomenon known as stress-tension-pain cycle. “The body attempts to isolate areas of trauma through a process known as muscle splinting. This is a protective mechanism whereby the muscles around the injured area contract to isolate the trauma and prevent movement that could lead to further damage. Scar tissue tends to build up in this area, as do taut bands of unyielding muscle fibers. Latent Trigger Points are felt very locally in the muscle tissue. They can be felt by both the therapist and client as a “knot” or a “bump” of tension in the muscle, and the resulting discomfort or pain is felt just in that area of tissue. Active Trigger Points feel much the same as latent trigger points from a tactile perspective, but they refer pain to other parts of the body. This is why sometimes “hunting” down the cause of muscular pain takes some time – the site of the pain isn’t necessarily where the pain is originating. Here are two examples of active trigger points and their referral sites, which would seem to have no correlation. A trigger point in the Gluteus Medius Muscle causes pain into the sacrum, the lower back, the lateral hip and can spill over into the thigh. 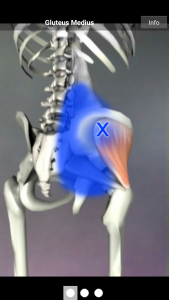 In this picture, you can see where X marks the spot of the location of a commonly found trigger point in the Glute Medius, and the blue shading is the pain referral site. 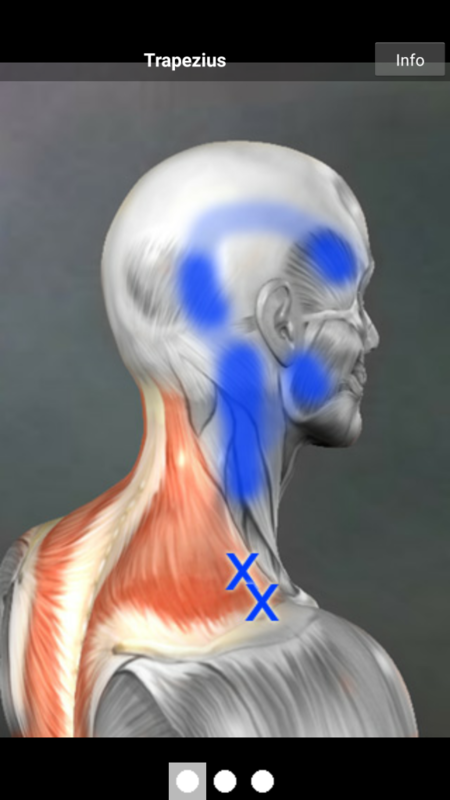 Trigger points in the upper trapezius muscle can cause pain up the side of the neck, the jaw, the side of the head and behind the eye. If bad enough, it can cause a headache called a “Ram’s horn headache” (because of the curved shape of the pain site) or even manifest as a migraine headache. A massage therapist trained in neuromuscular facilitation and trigger point therapy will use techniques to find trigger points in the body by using a knowledge base of common trigger points and their referral sites, and palpation skills. 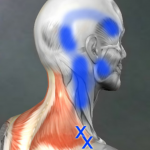 Then using deactivation techniques, we will calm the trigger point down to break the pain cycle. This modality is one that I use most often with my clients, because of its effectiveness. “Neuromuscular therapy attempts to disrupt the stress-tension-pain cycle by locating trigger points and deactivating them. Manual pressure applied directly to the trigger point for 8 to 12 seconds disrupts the flow of nerve impulses activating the referred pain zone, thus diminishing the sensations of pain felt there. Regular massage, stretching and making sure you are hydrated will all help minimize trigger point formation.